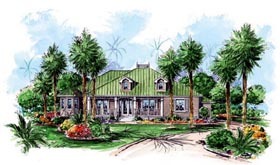 Step back to the Old Florida days with the Cape Sabal house plan. The spacious front sitting porch draws you in to a time that was all about relaxing. Nothing changes as you step through the front door, pass the study, and the floor plan opens up to a spacious great room overlooking the lanai and pool. The friendly open kitchen is a perfect space for fixing Sunday dinner. If the 1 car garage is not enough, ask us about how we can modify this plan to incorporate a larger garage! A casual, inviting lifestyle awaits you with the Cape Sabal Florida House Plan.